Dylan Bundy, the Minors' worst-kept secret, finally received the news that fans and the media alike have been waiting for: he's moving up. Bundy was promoted by Baltimore to Class A Advanced Frederick on Wednesday afternoon and is slated to make his Keys debut on May 26. The No. 4 overall pick and top high school player taken in the 2011 First-Year Player Draft dominated in the Class A South Atlantic League in eight outings, pushing the O's hand to make a move two months into the season. Bundy, whose older brother Bobby also pitches for the Orioles, did not allow an earned run in 30 innings at Class A Delmarva and gave up just five hits and two walks. He struck out 40 and did not allow a hit in his first four outings. 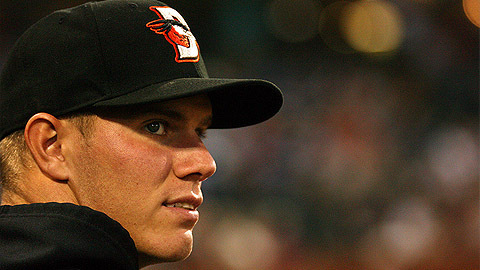 "What's important are the skills he develops to become a Major League pitcher," Orioles executive vice president of baseball operations Dan Duquette said of Bundy's promotion. The Orioles said Bundy will stay in the range of 125-130 innings in his first pro season -- he's been limited thus far in terms of innings rather than pitch counts as the O's look to ease the former Oklahoma high schooler into professional baseball. But with a fastball that flirts with 100 mph and nasty off-speed pitches, the O's top pitching prospect -- and MLB.com's No. 8 overall -- has been a promotion-in-waiting since his hitless Opening Day debut on April 6. "He can get players out because he has an exceptional fastball," Duquette said. "We want him to get where he needs to be to be a Major League pitcher, and that means working on changing speeds and his breaking pitches." Bundy has relied primarily on his fastball in each start but sprinkles in changeups and curveballs here and there. The numbers speak for themselves -- and Orioles fans would love to see the 6-foot-1 right-hander in Camden Yards by September -- but the Orioles are unlikely to rush his development at this point. According to MLB.com, Duquette said on Tuesday that director of pitching development Rick Peterson has compared Bundy's season to his "freshman year," a thinking that supports the organization's slow-moving plans for the Owasso (Okla.) High School product. Bundy's young career includes four hitless outings and four starts with six strikeouts or more, although he's only worked five innings twice in eight outings. He struck out nearly every batter he retired on May 8, whiffing eight in three frames. Bundy's most recent start came May 20, when he held Hagerstown to one hit over five innings, his second straight game in which he pitched five frames. A good performance at Frederick could see Bundy join his brother at Double-A Bowie sometime later this season.